I love eggs in every way. From sunny-side up to over-easy to hard boiled. My favourite is a close toss up between kopi-tiam-half-boiled-egg-in-a-saucer and Eggs Benedict. So imagine my delight on my first morning in Vegas when I spotted this in the cafe's menu. "... poached eggs and ham on a English muffin, smothered with hollandaise sauce..."
My friend Kev, obviously rubbing off some of the enthusiasm from me, beat me to waiter, ordering the Eggs Benedict with absolutely no clue what it was. Kev: I will order first. Waiter: Very well, sir. What would you be having? Kev: I would like the Eggs Benedict over-easy and I would like the change the muffin to croissant. A quick elbow nudge to his ribs quickly ensued as I whispered to the waiter to ignore him. A silent nod of acknowledgment from the waiter and we continued with the ordering from the rest of the table. I waited for our food to arrive before giving Kev his Eggs Benedict 101 introduction. True wisdom comes from knowing what you know as well as knowing what you do not know. hehehe looks good but too much sauce?? does it taste good? A poached egg cooked on the stovetop is one that is cooked in simmering water without the shell. Unlike a boiled or coddled egg that benefits from the use of an older egg, a poached egg is best when a very fresh egg is used. This is because the fresh egg, when placed into the heated water, will not spread out like an older egg, yielding better results with the shape and texture of the egg. not bad like that.. maybe you should make some for all of us..
Chocolate: How about you doing for us, since you are the one who is free these days? I am sure the recipe is available somewhere in the internet. No? hmm.. i did a search on where to find this breakfast in singapore..
Link to wikipedia will tell you how eggs benedict is prepared. 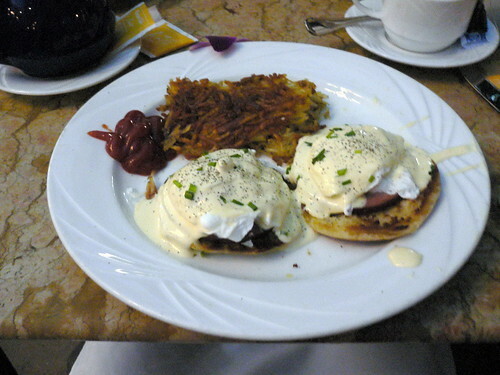 Then wikipedia will provide further links to how poached eggs is prepared and how hollandise sauce (the sauce that's placed on top of the eggs and muffin in eggs benedict) is prepared. Dun ask me to do it. Moi is too lazy... muahahahah! Gary: Whoa! Lawry's! I wonder how much it cost over there for the eggs benedict? Don't know where to get the sauce though... NTUC got boh? Pam: Eh? Then what would your egg be? Chocolate: I believe NTUC is not the only supermarket in Singapore lah. Try Cold Storage or Jason's. Now that you have the recipe, let see you get to work on it! errr.. where is Jason's? U know where in Singapore i can get a turkey now? Don't know cold storage got or not..